NOTE: You’re currently reading part 2 of a series I’m writing called “Building a Heroku Addon”. If you haven’t read the previous installment, you’ll want to go do that before continuing. Welcome back! Glad to see you again. In this article I’ll be sharing my Heroku addon plans with you. I’ll discuss exactly what I’ll be building, what it’ll look like, and how it’ll work. If there’s one thing I’ve come to learn through all of my years hacking on side projects, it’s this: always have a goal. I love looking at overall application metrics. There’s something inherently appealing to my own sense of vanity about seeing how many users / requests / etc. my application has served. These numbers aren’t at all business metrics – they’re vanity metrics. Through speaking with other developer friends, I’ve come to realize that it’s not just me – lots of other programmers feel the same way! It’s a rush when you see how much usage your code is getting – it’s motivating, inspiring, and more than anything: fun! 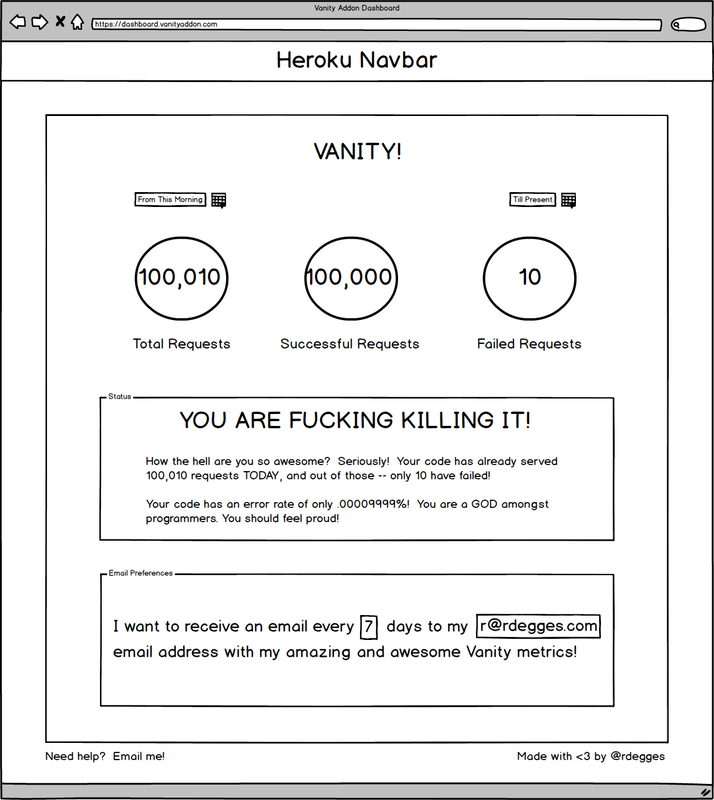 The purpose of the Vanity addon I’ll be creating through this series is to provide clear vanity metrics that Heroku developers will enjoy looking at. The metrics that Vanity provides should be encouraging, inspirational, and fun. Developers should want to check their Vanity dashboard as they hack on their projects, and should view it as a source of enjoyment: not dread. In regards to what needs to be built – there are several components to consider. I’ll need to store Heroku addon users in a database of some sort, and keep track of their ID and plan information. Next up, I need to build a marketing site to advertise the addon (primarily so developers searching for this thing on Google can find it). For this, I’ll build a 100% static site that lives at www.vanityaddon.com. I’ll need to throw something that looks clean and simple together – as well as generate some assets (a logo, a banner, etc.). It should open the user’s browser, and immediately show them the Vanity dashboard having already logged the user in with their Heroku SSO credentials. This is the primary interface developers will be looking at day-to-day, so it should be pretty, clean, and intuitive. To output their Vanity metrics to the console. The high level architecture of the Vanity addon will be fairly simple. All Vanity needs to do (when provisioned) is create a syslog drain to capture all of an application’s Heroku logs. These logs can then be parsed later to generate various metrics. Since all of the Vanity metrics are going to be fairly simple (at least, at first), there should be no need for developers to learn any new technologies to use this addon – they should simply be able to provision it from the Heroku marketplace and instantly start enjoying the service. How many total requests have been served over a given timeframe. How many total successful requests have been served over a given timeframe. How many total failed requests have been served over a given timeframe. In the future, as I think about this more, I’m sure there will be other metrics to consider – but for now, I think these will suffice. If you have any good ideas of what metrics you’d like to see included – email me! I’m not a great designer (I’m more of a backend guy), but I can most definitely hack together a clean front-end using tools like Bootstrap and Bootswatch. I think this is suitable for a first release, and as I continue working on this series I’ll fine tune the details. Again – if you have any ideas, let me know via email. I love getting input from fellow developers! Running the Vanity addon won’t be terribly expensive, but could most definitely become expensive over time as the addon will be storing every single log from every single Heroku dyno using Vanity. I can see this adding up to quite a bit of storage space in a short period of time. The main cost will likely be storage space on Amazon S3. Secondary costs will include some sort of database server for processing metrics. I’ve got a bunch of choices for this – so I’ll skip on the guess work for now and save that for the next article in the series where I discuss research. There will also be fees for running syslog servers which ingest all incoming logs. I’m not sure how well syslog “scales”, or what type of EC2 requirements it has for my estimated workload, so I won’t estimate costs here. Next up is email fees. I’ll likely be using mailgun to send email as I love their service, so depending on how many addon users I have, I might end up spending a few dollars per month on transactional email fees (not much). For addon plans, I’d like to definitely offer a free plan, which would most likely restrict metrics to the current day only (this way I can purge old logs to decrease my storage fees), and provide several other addon plans that provide for various levels of metric storage / analysis. Welp, that’s about it for this installment. Hope you had a good time! In the next article, I’ll be discussing all of my research. 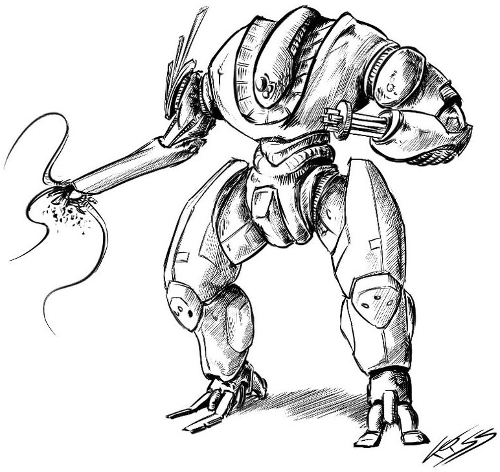 I’ll research and summarize the technical details of what I’ll need to do to build this thing, figure out cost approximations based on tools / usage, and also provide lots of useful links for anyone else (like you!) who wants to build their own Heroku addon. So… Stay tuned! More to come soon!